How to Fix Android Phone Running Slow and Freezing? Most of the Android devices, such as Samsung Galaxy and Huawei Mate/P smartphones, will run either slow or sluggish after the installation of the new Android Oreo update. Sometimes, for example, the Samsung Galaxy Note 9 freezes or becomes unresponsive while working with apps and this is common to all the Galaxy devices after the installation of the new Android OS update. If you scan through the official forum of the mobile service providers, you will find that there are so many people asking “How can I speed up my Android phone?”. If the performance of your Android device is compromised after the Android update, then you will have to perform the steps outlined in this article so as to make your slow Android phone run faster. Firstly, you need to understand the main reason for this problems. It could be because of unstable apps, low internal memory and storage. There is also a possibility of the system causing to freeze as a result of multiple apps or widgets. You will have to close unwanted apps running in the background, perform a soft reset, safe mode booting and much more. Let’s examine how to work with each method in detail. To close apps running in the background, you should tap on the Recent Apps key from any screen. The next step is to scroll and select the relevant app. You can close an app by swiping right or left over the app. Alternatively, it is also possible to close an app by tapping the X icon. Samsung also enables you to close all apps by tapping Close All option. The active apps can be viewed by selecting the Active Applications Icon. You can soft reset Android by holding the Power/Lock key until the handset switches off completely. You will also view the power options on the display and you need to select Power Off option. The next step is to wait for 20 seconds and hold the Power/Lock key button again till the phone switches back. If you are unable to switch off the phone using the above steps, you should remove the battery and wait for 10 seconds. We would recommend you to wait for one minute. The phone will switch on automatically after inserting the battery after a gap. The Safe Mode is an option provides not only by Windows but also smartphones. Even though you can’t perform any major work inside the Safe Mode, it is possible to complete emergency work to resume the functioning of the device. To boot Android into Safe Mode, you should switch off the handset and hold the power button firmly. You should press the Power button until the phone splash screen appears on the screen. Press the Volume down button soon after the appearance of the logo. You should continuously press the Volume down button until the handset reboots. The Safe Mode can be identified by the Safe Mode label located in the lower-left corner of the screen. You will be able to deactivate all third-party apps from within the Safe Mode, which will help you to isolate the root cause of the problem. It is also possible to test drive the mode and verify whether the problem has disappeared or not. Couldn’t exit from Safe Mode on Samsung Galaxy? You will find the solution here. You can easily uninstall third-party apps by following the steps mentioned below. Step 3: You need to swipe to the Downloaded screen and select the relevant app that you would need to remove or uninstall. Step 4: Finally, tap Uninstall option and select OK to confirm. It is to be noted that pre-installed apps can’t be uninstalled from the device. However, you can disable the apps by navigating to the Settings page. The disabled apps can be enabled by tapping on the Settings | Application Manager option and swiping the Turned Off tab. Finally, select the desired app and enable it. The uninstalled apps can be reinstalled from Google Play Store even the Play Store is not working. To wipe the Cache partition, switch off the phone, press and hold the Volume Up, Home, and Power buttons. The Power button should be released when the handset vibrates but you should continue to hold the Volume Up and Home buttons. The remaining buttons should be released when the Android System Recovery screen appears on the screen. The Wipe Cache Partition should be highlighted using the Volume Down button and select the option by pressing the Power button. The process takes few minutes to complete and you should wait until the cache partition has been wiped out completely. Finally, the system should be rebooted for the changes to take effect. If none of the above methods worked, you should perform a factory reset of your Samsung Galaxy S5 smartphone. It is absolutely essential for you to capture a complete backup of your Android device before venturing to factory reset Android. Because the factory reset will completely wipe out all the data from the phone including images, videos, ringtones, contacts and all the apps. However, the contents stored inside the memory card and SIM will be safe. Anyway, you still have chance to recover data from Android after factory reset with Android Data Recovery tool, if any data loss happens. Step 3 The third step is to clear the checkboxes located adjacent to Automatic restore and Back up my data option. Select Factory Data Reset | Reset device option. Normally, the process of factory reset starts immediately but you will be required to provide password or PIN upon request. The data will be reset upon clicking Delete All option. The factory reset option will be useful if you would like to sell or exchange your device. Step 1: Switch off your phone, press and hold the Volume Up, Home, and Power buttons at the same time. Step 2: Release the Power button when the phone vibrates. You should continue to press the Home and Volume Up buttons. Step 3: Release the other buttons when the Android System Recovery displays on the screen. Step 4: The next step is to highlight Wipe data/factory reset option by pressing the Volume Down button. You should scroll down to Yes–delete all user data using the Volume Down button. Step 5: Press the Power button to confirm the hard-reset option. You should wait until the smartphone has been completely reset. You can delete browser caches and cookies by tapping on Apps icon. Select Internet or Chrome to fire up the browser. You will view menu icon that can be identified by three vertical dots housed on the upper right-hand side of the browser. From settings page, navigate to the Advanced options and select Privacy. If you scroll down, you will view the relevant option to Delete personal data under Privacy. Select the check boxes next to Cache and Cookies and site data. The final step is to select the Done button to start the deletion of browser caches and cookies. 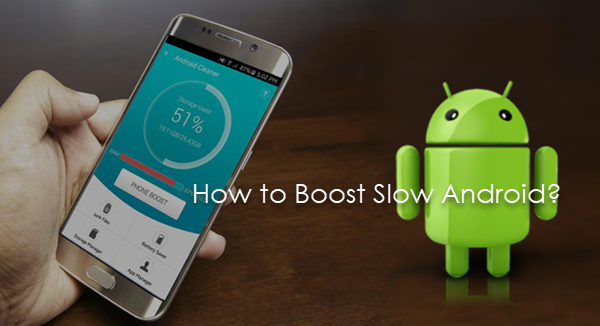 With the 8 solutions above, you must be able to speed up Android phone performance without any hindrance. If you have other unresolved issues related to Android, just let us know in the comment section below, and we are always glad to help you.